Door locks appear in different types and sizes. Some are easier to repair or replace than others. There are instances when you can do lock installation or lock replacement tasks yourself because your locks don't require complicated configurations or tools. Being familiar with the different types of door locks can be helpful especially when repairs, troubleshooting, or replacements are needed. These locks are simple mechanisms that don't include means for opening from the outside. They are primarily intended to provide privacy for the person inside a room. They are not designed to be tightly secured. A home lockout is unlikely with these locks since they can be easily defeated by force and replaced when necessary. These locks afford privacy and protection for properties although they are not tightly secured. Examples of these locks are the common doorknob locks used in most homes. They can be locked and unlocked from inside or outside. However, they can be easily picked. Also, the gap between the door and the door jamb can be exploited to move the locking component to unlock these locks. These locks are unlikely to be used in modern homes but there are some who still use them. They are used in addition to moderate security locks to create another layer of lock security. However, they are also easy to defeat. They don't even need to be picked since the screws that fasten them to the door can be easily removed with a screw driver. These locks are also used to support moderate security door locks. Deadbolts can be locked or unlocked from both sides. They are usually regarded as a more secure type of lock. Unlike the lock mechanism used in doorknobs, deadbolts are built to be stronger and more difficult to fiddle. 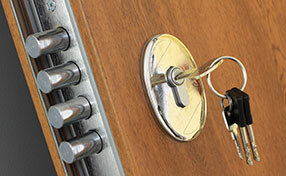 Locksmiths typically recommend the installation of deadbolts alongside door knobs for better security. Some door locks don't require keys. They can be opened by inputting a specific key combination. These keyless locks can be mechanical locks with rotating numbers used to input the combination. They can also be electronic locks such as those used in modern condominiums. They are expensive but they offer convenience and a high level of security. Also, a house lockout due to lost keys would be impossible with these locks.